Possibly the best tarantula ordering experience I have ever had. My new N. tripepii female courtesy of Tom Patterson. When people order tarantulas online, they generally go to the major vendors. Folks like Jamie’s Tarantulas, Pet Center USA, and Swift’s Invertebrates have stellar and well-deserved reputations for carrying a variety of stock and for their dependability and professionalism. The fact is, when buying and shipping living animals, you want to make sure you order from the best. Due to the volume of animals these larger dealers move, there are always plenty of glowing reviews to read if one does just a bit of research, and their names quickly come up in any search for those selling tarantulas. However, what often gets overlooked is that there are many awesome breeders out there who have been in the business for a long time and who offer great service with spectacular deals. Some of these same dealers are the ones who supply stock to the “big name” vendors as well. Unfortunately, these folks can be a little more difficult to find, especially for those new to the hobby who don’t know where to look. Tom Patterson (aka “Philth” on Arachnoboards) has been in the business for a long time, and he has a sterling reputation. Although I’ve come close to ordering from him many times due to his propensity to carry some of the more unique species I’m looking for, I didn’t pull the trigger until recently when I saw that he was selling some Vitalius paranaensis juveniles for a great price. After going through his recent price list, I found that he had several species I was interested in, and that it was finally time to place an order from him. Tom carries a good variety of tarantula species, including many that he breeds and produces himself. Those into other inverts will also find some cool arachnids, like trap doors and true spiders, as well. As far as tarantulas go, he has a good mix of some hobby staples, like G. pulchripes, Hapalopus sp. “Colombia large”, and P. cambridgei as well as unique and hard to find spiders like V. paranaensis, P. crassipes, and Aphonopelma crinirufum . For folks looking for larger sexed specimens, he regularly posts young adult females for sale as well. 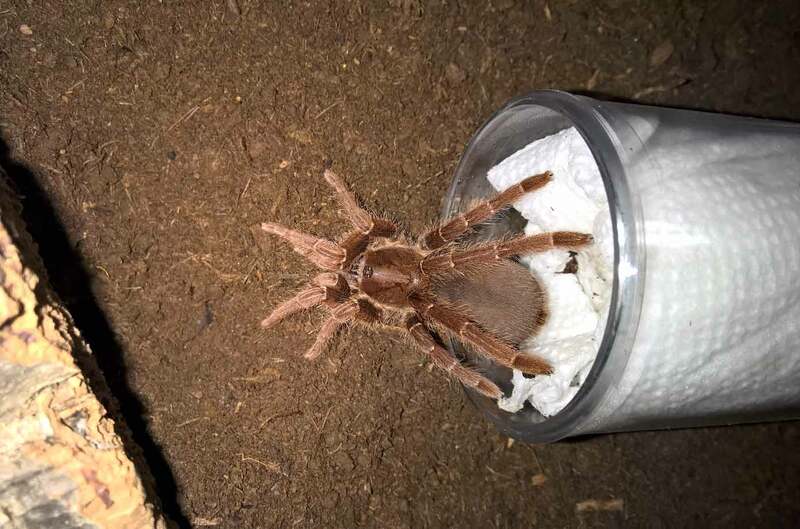 His prices were great, with the $25 P. crassipes slings, $50 4″ Sericopelma sp. “Santa Catalina” juveniles, and the $50 3″ P. muticus juveniles really jumping out at me. I also grabbed up a 5″ Nhandu tripepii sexed female, as I had been eyeing this species for a while. Tom doesn’t currently have a website, but instead periodically lists his stock on the For Sale section of Aracnoboards or in the Captive Bred Inverts – Classifieds on Facebook. Ordering was simple; I emailed him a list of the species I wanted to order, and Tom responded immediately with a Paypal invoice. Tom’s communication was excellent, and all of my emails were answered within an hour. My new L. crotalus being rehoused. This unique species was one of FOUR freebies. Because weather in my area was quite cold, we both decided it would be in the best interest of the animals to wait to ship until we got a few days of higher temps. During the wait time, I asked to add another spider to my order, and Tom was happy to accommodate me, quickly sending me a new invoice. When it looked like we’d get a stretch of warmer temps, Tom contacted me immediately to arrange shipping. He was happy to have my package held at my local FedEx facility (in fact he encouraged it), and my spiders were shipped overnight promptly. What an amazing box of spiders. All of my new animals arrived safely and in great shape. The box was foam lined and contained a heat pack, and each of the spiders was packed in its own vial, which was wrapped in multiple layers of newspaper, then cushioned with packing peanuts. And, what could make this transaction even sweeter? How about FOUR freebies. FOUR. For those who watch the video above, my shock is genuine. I’m used to getting some of the “give-away” species like LPs and B. albos, but what he included was unreal. 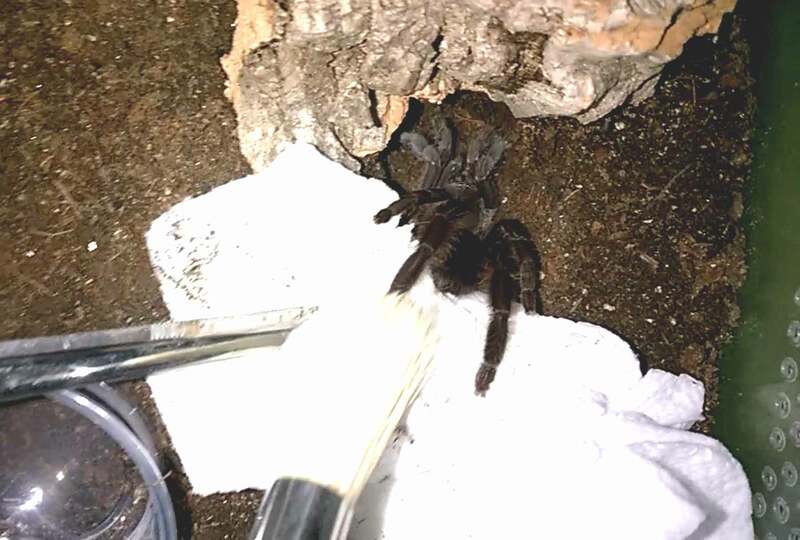 Added to my order was a 3″ P. muticus, an L. crotalus juvenile, a Lampropelma sp. “Borneo black” sling, and a Phlogius sp. “Eunice” juvenile. What was already going to be one of the coolest boxes of spiders I’ve ever received was just made twice as cool by the awesome freebies. 3″ P. muticus juvenile rehousing. My experience ordering from Tom Patterson was utterly perfect. Even if you took out the extra four (again FOUR) freebies, this would still be an excellent deal and transaction all around. Great selection, prices, communication, and packing made this purchase and amazing experience. 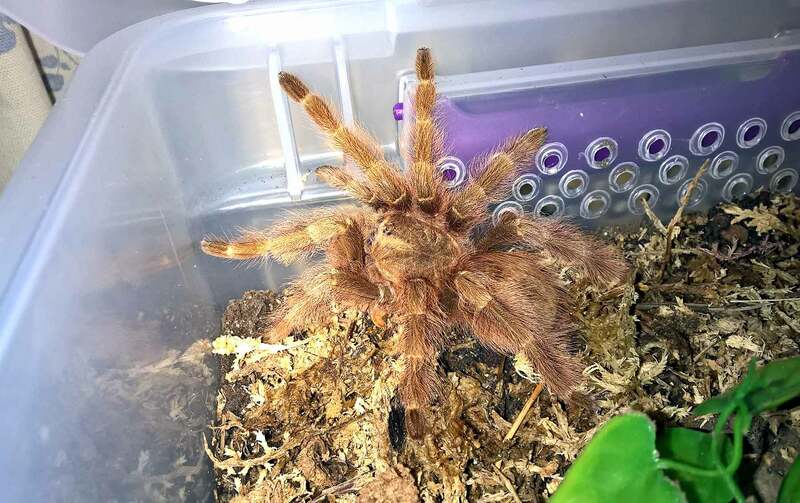 There isn’t a doubt that I’ll be ordering from Tom again in the future, and I would encourage anyone looking for tarantulas to check out his listings. NOTE: To view Tom’s Arachnoboards Classifieds posts, you have to be a member and signed in. If the link doesn’t open, I would encourage folks to create an account if only just to be able to view the For Sale/Trade/Want to Buy section. I will also be blogging his price lists whenever he posts one. Purchase price must be over $25. Payments accepted , Paypal ( Tompatterson77@gmail.com ) or Postal money orders. Shipping is $40 overnight FedEx only. Live arrival guaranteed. You must accept package on first delivery attempt. Temperature must be below 90°F or above 40°F. Must be 18 or older to purchase. U.S. sales only.